or click here for NEW BOOK by Yoel Sheridan,"Gold Ducats and Devilry Afoot. An Historical Narrative of The Trials and Tribulations of Henry Simons A Polish Jew in Mid-Eighteenth Century England"
or click here for CHINTHE WOMEN, Women's Auxiliary Service (Burma) 1942-46, researched and published by Sally and Lucy Jaffe, daughter and granddaughter of Commandant Nin Taylor, who formed and led the WAS(B). "(This book) brings to life those characters that made up the majority of East European Jewish immigrants who settled in the East End, with style and perception that makes for an exciting and moving fusion of history and literature." Professor William J. Fishman, Author and London Historian. "Shulem was born in the same year as Trotsky and Einstein. Of the three, only Shulem could make a decent pair of trousers"
From Here to Obscurity tells the story of the now lost Jewish East End of London through the eyes of Shulem, an immigrant from Poland, his wife Rivka, and Yulus, their English born youngest son. The opening half introduces us to the family, the thriving Yiddish-speaking community that inhabited the East End, its customs, landmarks and characters, and its turbulent history including the poverty and fascist incursions. We meet the family, Shulem, the patriarch and upright worker - Rivka, the warm and sympathetic matriarch - and their eight children - the master tailor, the three seamstresses, the socialist, the athletic author, the school station master, and, of course, Yulus, the youngest whose arrival forces the family to move from their two room dwelling off Brick Lane to a larger, yet still crowded, abode in Goodmans Fields. 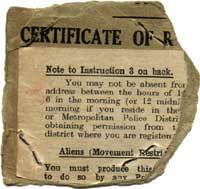 September 1st 1939 is the pivotal moment of the story. Shulem escorts Yulus to be evacuated from London to safety, as the Nazis march into to Shulems mothers town in Poland. What follows is the destruction of the East Ends Jewish homes and infrastructure through the targeted bombings of Hitlers Luftwaffe. Yulus is evacuated along with his schoolmates at Jews Free Central School to Sohamelycambs in the Fenlands, whilst Shulem stays behind in war torn London. Their lives are shattered by the war. On the morning after Yulus's Barmitzvah, he is unable to enter his home because of the thousand pound unexploded bomb that Hitler sends him as a birthday present. His school in the country finally closes due to lack of staff caused by recruitment into the armed forces, and he has to take his matriculation under the threatening onslaught of the German V-1 flying bombs. Later, even after the Nazi concentration camps are liberated, over twenty members of his youth club are killed in the last German V-2 rocket to fall on London. Shulem's relatives are caught up in the Holocaust. His mother, sister and family, who remained in Poland, are transported to the Treblinka death camp. He doesn't know the fate of his brother and family who lived in Hamburg in Germany. But after the Jewish Hagganah in Palestine accidentally sink the Patria, a British deportation ship, another brother and family, escaping from Danzig, are deported to the island of Mauritius in the Indian Ocean for the duration of the war. Despite all these traumatic historical events, 'From Here to Obscurity' is an uplifting tale of human warmth, humour and solidarity in the midst of overwhelming global forces. 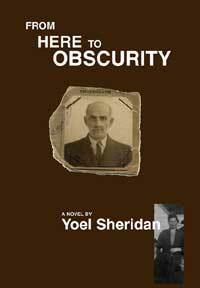 Yoel Sheridan, author of 'From Here to Obscurity', was born in the East End of London in 1928. Some years ago, whilst watching television, he saw Joseph Burg, the then Israeli Justice Minister, on a visit to his one-time home town in Germany, pointing to an undamaged building and saying that that was where he had lived prior to being forced to leave Germany due to the rise of Nazism. "I turned to my wife Tova and said how strange. Why strange? She asked. Well, I said, I cannot visit my previous abode in the East End of London, because it was totally destroyed by the German bombers in world war two. Not only was my house destroyed, but the whole street. Destroyed too, were my infant and senior schools, the Synagogue in which I had my barmitzvah and the infrastructure of the thriving Jewish Yiddish speaking community that lived there prior to the outbreak of the war." So began, Yoel's research into the history of the Yiddish speaking East End between the wars, and finally this novel that faithfully re-creates that community and its demise, through the eyes of one family. Yoel has lived in Israel since 1973. "Yoel Sheridan's meticulous reconstruction of the Yiddish-speaking East End of 1933-1945..... certainly succeeds in breathing life and vibrancy into a locality and a way of life which, the author asserts, have largely been consigned to oblivion, both by the German bombers and the absence of written records.... Shulem and Rivka .... are characters who earn the reader's sympathy. So too does their youngest son, Yulus..... However.... it is not the characters but the pulsating vigour of the East End and the era itself which are the protagonists of what may be described as a memoir of time and place.... The rise of Nazism and the Second World War are major background events. Nearer home, the assertiveness of the local Fascists is well drawn in a comprehensive description of the so-called "Battle of Cable Street".... (From Here to Obscurity) is a serious tale which will be of considerable interest to any student.... of the old Jewish East end." "This is a well-executed historical novel about London's Jewish East End, covering the 1933-1945 period......Sheridan is successful in portraying the character types that we could just as easily find in Lodz or the Lower East Side of New York....... From Here to Obscurity is a historically perceptive and exciting chronicle that gives us a moving fusion of history and literature. Local author Yoel Sheridan does a good job of bringing us the ambiance, lifestyle and nostalgic humor of London's East End. Indeed, I found the historical descriptions absorbing." "From Here to Obscurity (is) the story of a family of Jewish immigrants from Eastern Europe living in the East End of London during the 1930s and 1940s. (It) is the base from which the author projects, in much detail, the events of those years... The struggles through poverty, typified by overcrowded tenement housing, low wages and frequent unemployment, are described in a sensitive and absorbing manner... the author shows an incredible determination throughout to include a ....detailed description of events..... from Hitlerite Germany to the games played on the streets, from the evacuation of children from the city to a typical seder night, from the horrors of the Blitz to the equipping of a boy about to start at Jews' Free School in Bell Lane - all are recounted with perception and compassion....Yoel Sheridan has performed a service to the history of the Jews in this country.... From Here to Obscurity is an accurate and fascinating chronicle of life in the Jewish East End during the 1930s and 1940s that fills a gap that has existed for too long." This semi autobiographical historical novel takes you through the years 1933-45 in the Yiddish-speaking area of the East End of London. Having lived there through these years, this book to me is a treasure. Everything is so true and brilliantly told, I felt as though I had been transported back there again. The friendship - menschlichkeit - of the folk is something to recall with a sense of loss for the good old days while family life is portrayed with compassion and made so easy to understand. The author translates Yiddish phrases immediately - no need to constantly refer to the back pages! Jewish traditions and holidays celebrated are detailed so accurately I could picture myself sitting round the 'seder' table. Looking back, life in the East End was never easy, but it was a life where you were surrounded by caring, hospitable people........The family life of the main characters, Shulem and Rivka, are warmly told. Their efforts to adjust to a strange country where they didn't speak the language, whilst worrying about family left behind in Germany and Russia, was typical of the concerns of many of the residents. It is an accurate portrayal of the Jewish East End that no longer exists and is well worth a read. It's absorbing, enjoyable and so wonderfully told, that I'll be continuing to refer to my copy whenever I'm feeling nostalgic. For full review as a jpg image (155k) click on image. .... It's grim, but it's funny and touching too .... it's called a novel, but it's probably the most 'real' book about the East End of the thirties and forties that you'll read this year. "Yoel Sheridan writes a novel that appears to be close to his heart. This is a book about the East End in London during the years 1933-1945, where forty percent of Jewish Londoners lived. The story follows Shulem, a master tailor, and his family during these crucial years of Hitler's rise to power, the rising anti-semitism in London, and the purposeful bombing of the Jewish section of London by the Germans. The story follows the ups and downs of pre-war and wartime life in the Yiddish community of London. Shulem, his wife Rivka and their youngest son Yulus are the eyes and narrative voices for the story. This is a well-researched and interesting novel of Jewish life in a city that is not often mentioned in Holocaust studies....Recommended...." Distributed by Central Books Ltd, 99 Wallis Road, London E9 5LN, England. Tel No. (+44) (0)208 986 4854. If unsure which Postal Zone you fall into please contact mo@centralbooks.com.